A prayer place situated in a 13.5 hectares of land, located in the province of Tanay Rizal is Regina Rosarii Institute for Contemplation in Asia (RICA). Regina RICA is open from 8am to 5pm, except Tuesdays. Entrance is free. Sunday mass schedule is at 1130am and 330pm. While there, suggest you eat at the Pasilungan, where they serve resonably priced (approximately P100 for a value meal - rice, one vegetable viand and soup) delicious vegetarian meals. For those who prefer to bring in their own food, there are "bahay kubos" available for rent. They also sell Regina RICA products and mementos to raise funds for the continuous building of the community and various outreach programs for the needy. Our travel took about an hour and a half (including the casual stop over to ask for directions) from Taytay to Tanay. The way back from Tanay to Taytay took only an hour. We were welcomed to a gate guarded by two statues of saints and by a guard who nicely directed us to the site. Our attention quickly transferred to a huge statue of our Lady on top of the hill. 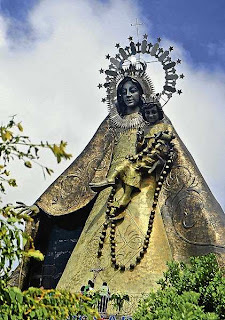 A gigantic statue of Our Lady. Although the community is still under going construction (the church is still half built and there are a number of facilities which have not yet even begun building), already a feeling of order and peace transcend from the place. I have taken very few pictures and this blog does not give justice to the beauty of Regina RICA. 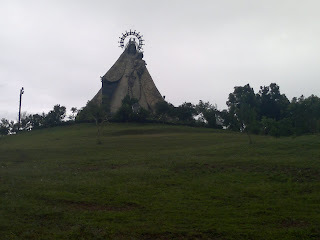 You would have to go there to enjoy and feel for yourself the serenity this place provides, become one with nature and with God. Wahnsinnig schöne Farben und eine Landschaft zum Verlieben. Erinnert mich an ein Gemälde, ich glaub es heisst „Rainy Landscape“ von dem russischen Maler Kandansky http://WahooArt.com/A55A04/w.nsf/OPRA/BRUE-8EWL66, welches ich auf WahooArt.com gesehen habe. Dort können Sie sich Gemälde drucken lassen oder auch handmalen lassen. Wirklich ein grossartiger Platz wo Sie die gleiche Art von Ihrem Gemälde finden können.